For other uses, see Pasha (disambiguation). "Paşa" redirects here. For the footballer, see Cahit Paşa. 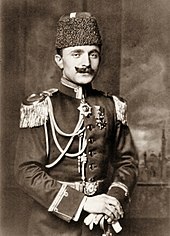 Pasha or Paşa (Ottoman Turkish: پاشا‎, Turkish: Paşa), in older works sometimes anglicized as Bashaw, was a higher rank in the Ottoman political and military system, typically granted to governors, generals, dignitaries and others. 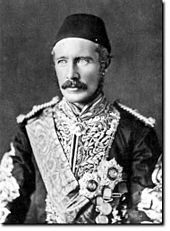 As an honorary title, Pasha, in one of its various ranks, is similar to a British peerage or knighthood, and was also one of the highest titles in the 20th century Kingdom of Egypt. According to Etymonline, pasha is derived from the earlier "basha", itself from Turkish "baş/bash" (head, chief), itself from Old Persian pati- "master", (from Proto-Indo-European *poti) and the root of the Persian word shah. According to the Oxford Online Dictionary, the word has its origins in the mid-17th century, and was formed as a result of the combination of the Pahlavi words pati- "lord", and shah. According to Josef W. Meri and Jere L. Bacharach, the word is "more than likely derived from the Persian Padishah". The same view is held by Nicholas Ostler, who mentions that the word was formed as a shortening of the Persian word Padishah. According to etymologist Sevan Nişanyan, the word is derived from Turkish beşe ('boy, prince'), which is cognate with Persian baççe (بچّه). Old Turkish had no fixed distinction between /b/ and /p/, and the word was spelled başa still in the 15th century. As first used in western Europe, the title appeared in writing with the initial "b". The English forms bashaw, bassaw, bucha etc., general in the 16th and 17th century, derive through the medieval Latin and Italian word bassa. Due to the Ottoman presence in the Arab World, the title became used frequently in Arabic, though pronounced basha due to the absence of the /p/ sound in Arabic. Within the Ottoman Empire, the Ottoman Sultan had the right to bestow the title of Pasha. It was through this custom that the title (Egyptian Arabic pronunciation: [ˈbæːʃæ]) came to be used in Egypt, which was conquered by the Ottomans in 1517. The rise to power in Egypt in 1805 by Muhammad Ali, an Albanian military commander, effectively established Egypt as a de facto independent state, however, it still owed technical fealty to the Ottoman Sultan. Moreover, Muhammad Ali harboured ambitions of supplanting the Osman Dynasty in Constantinople, and sought to style his Egyptian realm as a successor sultanate to the Ottoman Empire. As such, he bore the title of Pasha, in addition to the official title of Wāli, and the self-declared title of Khedive. 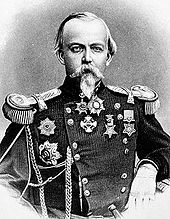 His successors to the Egyptian and Sudanese throne, Ibrahim, Abbas, Sa'id, and Isma'il also inherited these titles, with Pasha, and Wāli ceasing to be used in 1867, when the Ottoman Sultan, Abdülaziz officially recognised Isma'il as Khedive. The title Pasha appears originally to have applied exclusively to military commanders and only high ranking family of the Sultans, but subsequently it could distinguish any high official, and also unofficial persons whom the court desired to honour. It was also part of the official style of the Kapudan Pasha (Grand Admiral of the Ottoman fleet). Pashas ranked above Beys and Aghas, but below Khedives and Viziers. Three grades of Pasha existed, distinguished by the number of horse-tails (three, two and one respectively; a symbol of Turco-Mongol tradition) or peacock tails, which the bearers were entitled to display on their standard as a symbol of military authority when on campaign. Only the Sultan himself was entitled to four tails, as sovereign commander in chief. Istanbul's Shaikh ul-Islam, the highest Muslim clergyman, of cabinet rank. If a Pasha governed a provincial territory, it could be called a pashaluk after his military title, besides the administrative term for the type of jurisdiction, e.g. eyalet, vilayet/walayah. Both Beylerbeys (governors-general) and valis/wālis (the most common type of Governor) were entitled to the style of Pasha (typically with two tails). The word pashalik designated any province or other jurisdiction of a Pasha, such as the Pasha or Bashaw of Tripoli. Ottoman and Egyptian authorities conferred the title upon both Muslims and Christians without distinction. They also frequently gave it to foreigners in the service of the Ottoman Empire, or of the Egyptian Khedivate (later Sultanate, and Kingdom in turn), e.g. Hobart Pasha. In an Egyptian context, the Abaza Family is known as "the family of the pashas" for having produced the largest number of nobles holding this title under the Muhammad Ali dynasty and was noted in Egyptian media[when?] as one of the main "families that rule Egypt" to this day, and as "deeply rooted in Egyptian society and… in the history of the country." As an honorific, the title Pasha was an aristocratic title and could be hereditary or non-hereditary, stipulated in the "Firman" (patent of nobility) issued by the Sultan carrying the imperial seal "Tughra". The title did not bestow rank or title to the wife nor was any religious leader elevated to the title. In contrast to western nobility titles, where the title normally is added before the given name, Ottoman titles followed the given name. In contacts with foreign emissaries and representatives, holders of the title Pasha were often referred to as "Your Excellency". In modern Egyptian and (to a lesser extent) Levantine Arabic, it is used as an honorific closer to "Sir" than "Lord", especially by older people. Among Egyptians born since the Revolution of 1952 and the abolition of aristocratic titles, it is considered a highly formal way of addressing one's male peers. Although it is no longer an official title, high-ranking officers of the Turkish Armed Forces are often referred to as "pashas" by the Turkish public and media. In the French Navy, "pasha" (pacha in french) is the nickname of the Commanding Officer, similar to the term "skipper" in the anglo-saxon navies. 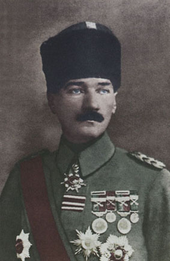 Yusuf Murad Pasha (Józef Bem), Polish general and a national hero of Poland and Hungary, who served in the Ottoman Empire. ^ "Pasha". Oxford Dictionaries (English). Archived from the original on 16 April 2017. Retrieved 15 April 2017. ^ Ostler, Nicholas (2010). The Last Lingua Franca: English Until the Return of Babel. Penguin UK. pp. 1–352. ISBN 978-0141922218. "Even in Ottoman Turkish much military vocabulary is borrowed from Persian. The highest rank, paşa, was a shortening of Persian padišāh 'emperor'. ^ Sevan Nişanyan, Sözlerin Soyağaçı: Çağdaş Türkçenin Etimolojik Sözlüğü ['Family trees of words: Etymologicial Dictionary of Contemporary Turkish'], s.v. "paşa" Archived 2012-11-20 at the Wayback Machine. ^ Tietze, Andreas (2002). "başa". Tarihi ve Etimolojik Türkiye Türkçesi Lugatı (in Turkish). Simurg Kitapçılık. p. 290. ISBN 978-975-7172-56-7. ^ "عائلات تحكم مصر.. 1 ـ 'الأباظية' عائلة الباشوات". Archived from the original on 2015-11-28. ^ "Rushdi Abaza, AlexCinema". www.bibalex.org. Retrieved 2012-08-23. ^ "جريدة الدستور البصرية". www.al-jazirah.com. Archived from the original on 8 September 2017. Retrieved 29 April 2018. This article incorporates text from a publication now in the public domain: Chisholm, Hugh, ed. (1911). "Pasha" . Encyclopædia Britannica. 20 (11th ed.). Cambridge University Press. p. 883.